Solar electricity: How does it work? In 1954, scientists at Bell Telephone discovered that silicon, an element found in sand, created an electric charge when it was exposed to sunlight. This discovery led to the development of solar cells that captured the sun’s energy and turned it into electricity. Since then, the technology has evolved, and solar power systems now provide incredibly attractive financial benefits for homeowners, businesses and non-profits across the United States. Thanks to solar panels, we have access to an inexhaustible source of power – the sun. Throughout the day, the cells on your solar panels absorb the energy from sunlight. Circuits within the cells collect that energy and turn it into direct current (DC) electricity. The DC electricity is passed through a device called an inverter to convert it to the alternating current (AC) electricity used by most homes and businesses. You can use that electricity in your home, store it with a solar battery, or send it back to the grid. Solar panels collect and convert the sun’s energy into electricity. They are a key component of a solar panel system. Most commonly available panels today are either poly-crystalline or mono-crystalline solar panels. The key differences between poly- and mono-crystalline panels are in efficiency and cost. Typically, mono-crystalline panels are more efficient (and thus more expensive) than poly-crystalline panels. To find the right solar panels for your home and your wallet, there are a variety of criteria to keep in mind, including product quality, durability, and long-term performance. Learn more about how to evaluate solar panels in the EnergySage Buyer's Guide for solar. The cells in your solar panels collect the sun’s energy and turn it into direct current (DC) electricity. Most homes and businesses, however, use alternating current (AC). Inverters change the DC electricity from your panels into usable AC electricity. There are three basic approaches to solar inverters. 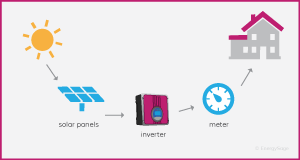 String (or centralized) inverter: A single inverter is used to connect your entire array of solar panels to your electrical panel. String inverters are the least expensive inverter option, and cost less than micro-inverters. However, if one of the panels stops producing electricity, even due to temporary shading, it can bring down the performance of the whole system. Micro-inverters: If you choose micro-inverters, one will be installed at each solar panel, which allows each panel to maximize production. If some of your panels are shaded at different times of day or if they aren’t all installed facing the same direction, micro-inverters will minimize performance issues. The cost of micro-inverters tends to be higher than the cost of string inverters. Power optimizers: Systems that use power optimizers are a hybrid of micro-inverter and string inverter systems. Like micro-inverters, power optimizers are installed at each panel. However, instead of converting the DC electricity from the solar panels into AC electricity, the optimizers “condition” the DC electricity before sending it to a centralized inverter. Like micro-inverters, they perform well when one or more panels are shaded or if panels are installed facing different directions. Power optimizer systems tend to cost more than string inverter systems, but less than micro-inverter systems. To perform at their best, solar panels should face south and be installed at an angle between 30 and 45 degrees (depending on how far you are from the equator). Panels facing east or west and at a pitch angle of five degrees or more will still work well, but will produce 10 to 20 percent less electricity than those installed under ideal conditions. There are two types of mounts: fixed mounts, in which the panels remain stationary, and track mounts, which allow panels to “follow” the sun as it moves across the sky during the day (single-axis track mounts) and during the changing seasons (dual-axis track mounts). Track mounts are only suitable for panels installed on the ground. Fixed mounts are less expensive and the only option if you are installing your panels on your roof. Track mounts are more costly, but they allow you to increase your panels’ electricity production by 30 percent or more. Because of their additional cost and increased maintenance, track mounts are best suited to situations where you have limited space and want to maximize the electricity production from a limited number of solar panels. While some solar installers charge extra for installing a monitoring system, it can provide significant value over the lifetime of your solar panels. Monitoring systems help you identify any performance issues to ensure that you maximize the electricity production (and therefore the financial returns) of your solar panel system. On-site monitoring: The monitoring device is physically located on your property and records the amount of electricity produced.